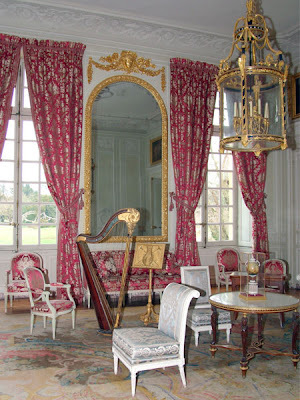 "Isabelle Thornton" Le Chateau des Fleurs: Marie Antoinette a Versailles. M is for Marie Antoinette. 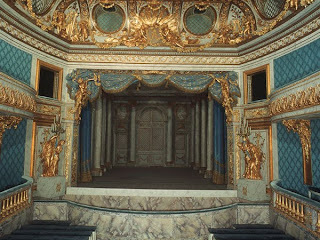 My Favorite place to look au Chateau de Versailles is http://www.chateauversailles.fr/domaine-marie-antoinette. 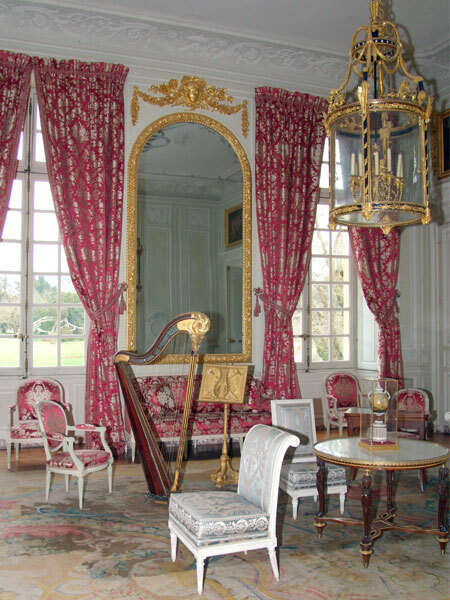 You can See Marie Antoinette private Domain on this page. 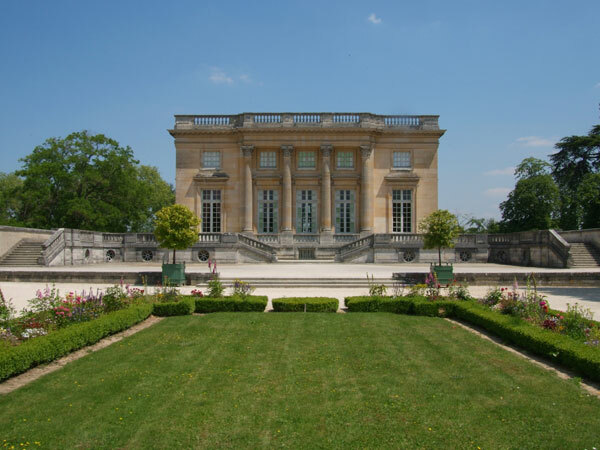 This is the official French Chateau de Versaille Website. It is all in French, i think they have a tool to translate it. Here is her Palace where she would take refuge...Le petit Trianon. Don't you like the bright colors!!! Wow! it's magnificent!!! My daughter is going to paris in June - looks like she'll have a fabulous time!!! Shelly, have you seen the JC Penney beddings. They are expensive but you only get one and never get bored of it. I only have 2 beddings.Use them, and love them. The blue one is from A Local store, way cheaper though. Oh, how stunning! How wonderful to be pampered like that! Paris Paris, ce Chateau est magnifique! Love the picture of the outside!! I really do need to see that movie sometime! Just beautiful!!! I can't imagine actually living there!!! Ola la la....Versailles..........i have been there.....so beautiful...i 'am in love of france...especially.....paris.......versailles.............hugs from me.....bye! i just spent way too long on the versailles website, thanks to you. :) i want to visit so badly! i need to build up that vacation fund. Oh, I loved Versailles and I would love to go back again. I guess for now I will settle with seeing the movie. Hi girl. I love your blog. You are so creative. Have a great week. Thanks for sharing the photos. I loved that movie..especially liked the farm scenes, it seemed idyllic. I would love to go to Paris!! Such a great movie! Can't wait to visit Paris later this year! Her farm is so nice! I have this movie on my Netflix list. Can't wait to see it! Love Love Love!! THanks for stopping by my blog. Oh how I did love this movie and experiencing Marie's home when I visited Paris a few years ago. Simply magical! Thank you for sharing. Thanks for sharing these great pictures. 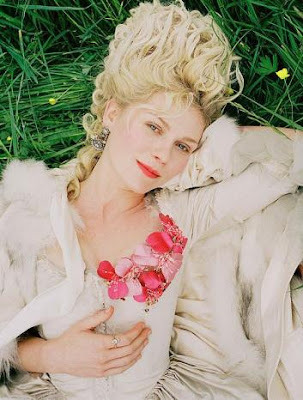 I absolutely LOVE the Sofia Coppola "Marie Antoinette" movie! I really don't know about her that much. I did see that movie though. She really had a beautiful place. Great pictures, I love all the beautiful places. I love France. I think my favorite part is the little farm. So absolutely charming! I would love to see that someday! 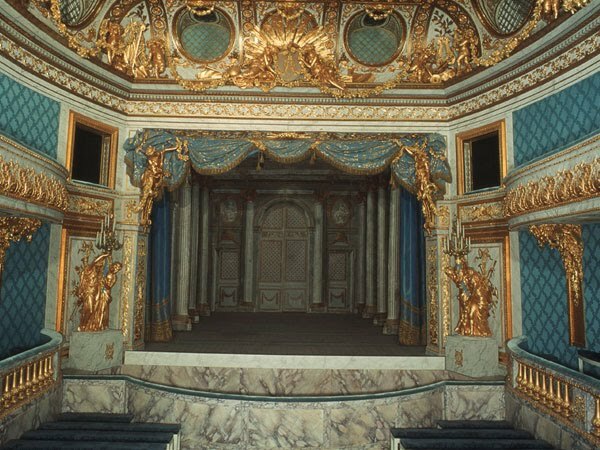 What a lovely little blue theater! 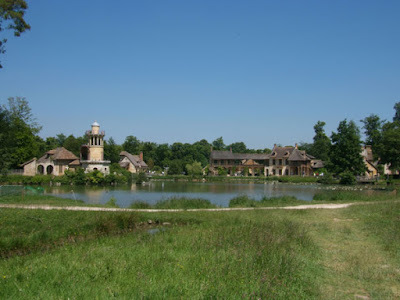 PS- My daughter traveled to France a couple of years ago and saw Versailles. She loved every second of her stay. She stayed with a family in Aix for a while and then she also spent a little bit of time in Paris. She studied french all through high school and some in college too, and was so sad when she didn't have room to fit any more college french classes, because she was trying to squeeze in all the classes she needed for her double major. She really hopes to go back someday soon. Oh my! What a marvelous "M" post. I am transported to another time and place of grace and elegance on my stop here on Alphabe-Thursday's little journey through the letter "M"! Such beautiful photos. What a life. Wow! I love these pictures. I hope your pregnancy is going well and you and your family are ready to welcome this new life into the fold. I just stumbled onto this wonderful post and I had to comment. I wrote a post about a couture apron I created with Le Petite Trianon being my inspiration. LOVE the Coppola movie...candy for the eyes. Would love for you to come take a peak and see if I did Marie justice.